With summer comes the wonderful abundance of fresh garden produce. Green beans, cherry tomatoes and beautiful sweet Basil are popped into my garden basket; with these few ingredients I will make a salad that is enormously satisfying. 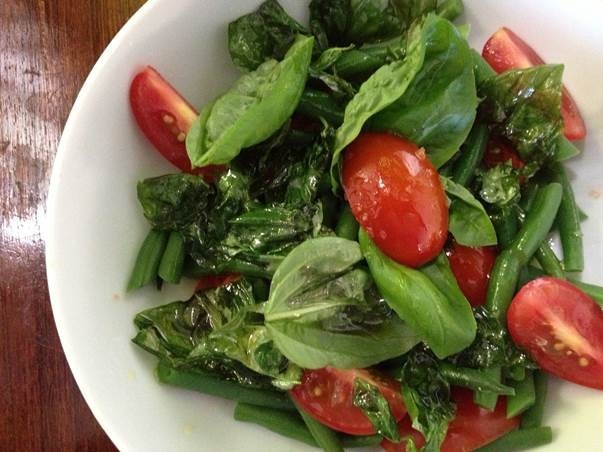 Infusing the basil in the olive oil brings out its wonderful aromatic flavour, and together with the tomatoes provides beautiful summery notes to this gorgeous salad. The salad may be served as a starter or as a light lunch, the latter served with some nice French baguette and a glass of crisp white wine. Top and Tail the green beans then blanch them in boiling salted water; remove when they have turned bright green and are still slightly crisp (about 4-5 minutes), refresh in cold water. Cut the beans into three or four pieces and set aside. Gently tear the basil leaves into small pieces; reserve a few leaves to use later as garnish. Pour the olive oil in a pan, add the torn basil leaves and heat gently for about 1-2 minutes, until the basil begins to sizzle, change colour and crisp up slightly. 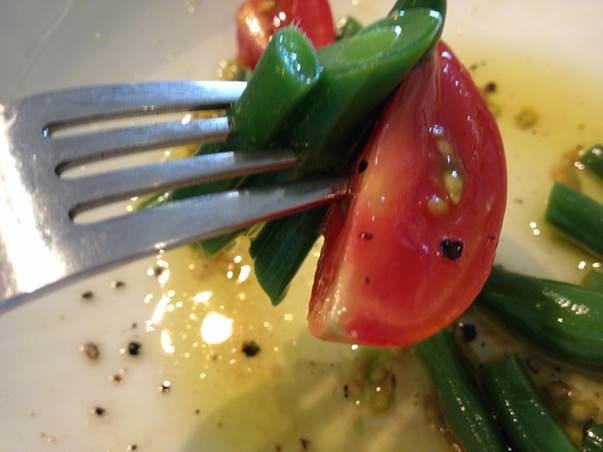 Place the chopped cherry tomatoes and cooked green beans in a bowl; pour over the basil infused oil with the gently sizzled basil leaves; season with flaked sea salt and freshly ground pepper. Toss together gently and leave for 15-30 minutes to allow all the flavours to infuse and for the basil infused olive oil to mingle with the tomato juices. To serve: garnish with a few fresh basil leaves. Where Have All The Good Eggs Gone…? Trying to find really fresh eggs is becoming as scarce as hens’ teeth. 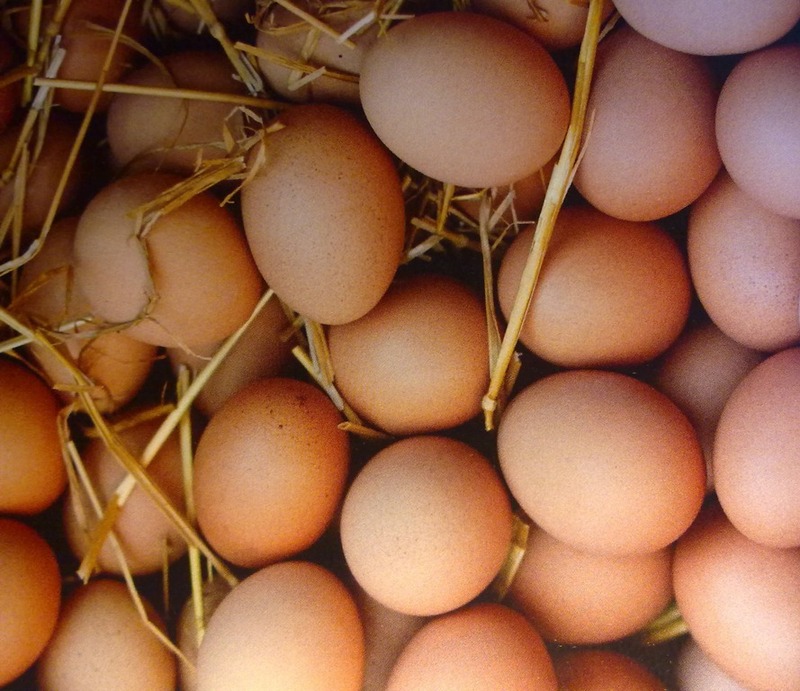 The eggs on offer are usually more than a week old, the whites runny and the yolk flattened. A fresh egg should have a rounded plump yolk, the white should have a thick gelatinous layer that clings all-round the yolk, followed by a thinner outer layer. After one week the yolk is flatter and the two separate textures of white are not quite so visible. I am yet to be satisfied with the disappointing supply of eggs which the local supermarkets are selling; they are old and miserable in every way, literally falling apart as you crack the egg open. There is absolutely no visible difference between the two white textures in fact the whites are runny, barely able to hold the now very flat yolk, in most cases actually falling away from the egg yolk. It is impossible to poach stale eggs, so when these gorgeously fresh beauties arrived from a good organic, free ranging happy chicken source, I could not resist and made this treat of deliciously oozing poached eggs on toast with a fancy name. In a small pan simmer the vinegar with the Bay leaf until the vinegar is reduced by half, remove the bay leaf and leave the vinegar to cool. Melt the butter but do not boil, and leave to cool to blood heat. A hand held blender is best for such a small quantity; place the egg yolk, lemon juice and a pinch of salt in a suitable bowl and blend until frothy, pour in the butter in a steady stream alternating with the vinegar until both are incorporated, and a thick creamy sauce has formed. Adjust the seasoning. Grill the bacon, soft poach the eggs in a pan of simmering water, and toast the muffin. 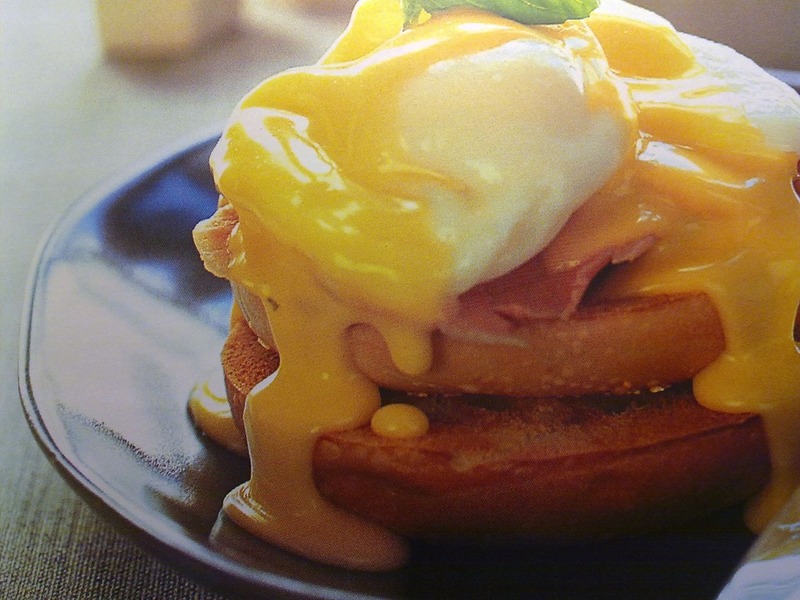 Place the bacon onto the toasted muffin, top with the well-drained poached egg and drizzle with some Hollandaise sauce, season with salt and pepper. Enjoy the moment, I did.